“Would you be interested in joining the faculty for a future SAS voyage?” I paused for a moment on the end-of-voyage evaluation form. Many of my colleagues were on their third or fourth SAS voyage. I did not feel ready to check the “Yes” or “No” box. Instead I scribbled “Not sure.” I needed more time to process the experience. My answer, on reflection, is “Probably not.” Of course, it was a wonderful opportunity to take a round-the-world sea voyage; if it had not been for SAS, I would likely never have done it. However, we never spent long enough in any port to have more than brief, incomplete impressions of a country. The teaching schedule at sea, with every A day followed by a B day (with only the occasional TBA day) was grueling; I never had enough time to prepare for classes or provide students with the feedback I felt they deserved. Outside class the activities calendar was packed. Towards the end of the voyage, as my energy level dropped, I went to see the ship’s doctor. After taking my blood pressure, he told me I was under too much stress and advised me to relax. He did not explain how I could do so. Early in the voyage, I came to realize that high enrolment in my classes had nothing to do with what I was teaching or how well I was doing it. The students had signed up for the voyage, then remembered they also had to take classes; because many were communication majors, they selected my classes to fulfill requirements. Some did exceptionally well and enthusiastically undertook the in-port assignments I gave them. I stayed in touch with half a dozen for several years as they went on to graduate school and interesting careers. Most were, well, just students; they did what they needed to do to earn a C and were pleasant enough. Then there were the students who, in my fantasies, I would have liked to have thrown overboard, along with their parents’ credit cards. They showed little interest in learning about anything, and certainly not about other cultures. Their mission was to party in foreign ports where there was no minimum drinking age, and then smuggle liquor onto the ship. The group included the pair that had trashed the hotel room at the Ngorongoro Crater. Ruth and I had filed a report and expected them to face severe disciplinary action when they returned to the ship. At a minimum, we reckoned they would not be allowed to leave the ship at Chennai. Instead, a felony offense resulted in a misdemeanor punishment—a two-hour delay in leaving the ship. The weak response did not reflect well on an administration that issued rules for behavior, then failed to enforce them or mete out appropriate penalties. It left me wondering whether their safari should have ended with another cultural experience—a couple of days inside a Tanzanian jail. The Spring 2003 voyage was the SAS swansong for the Universe Explorer. The planned 10-day refit in Hong Kong was postponed until the following year. After inspection in August 2004, the ship’s owners decided that it was going to cost too much to fix her up for more voyages and sold her for scrap. In November, she made her final voyage to Alang on India’s northwest coast, where a six-mile stretch of beach has been described as “the world’s largest graveyard for ships.” In breakers yards, workers wielding blowtorches and hammers strip decommissioned cargo ships and cruise liners, salvaging steel and other materials. The Universe Explorer was beached on December 7, 2004. Five months later, only her rusting hulk remained on the oil-stained beach. My recollections of the rest of the voyage are hazy. I took photos but made few notes and did not send any e-mails to family and friends. From Nagasaki, we made the short hop across the Sea of Japan to Busan (Pusan), the second largest city in South Korea and the country’s main port. By this time, SAS had announced that to make up for missing Vietnam and China, two ports had been added—Seward, Alaska, and Victoria, British Columbia. We had packed for warm weather, not for the Alaska spring, so the first item of business in Busan was to shop for winter coats from Russian traders on one of the city’s markets. We visited the city’s famous aquarium and took a day trip to Gyeongju, the capital of the dynasty that ruled most of the Korean peninsula from the 7th to the 9th centuries. I took pictures of monuments, palaces and traditional houses. 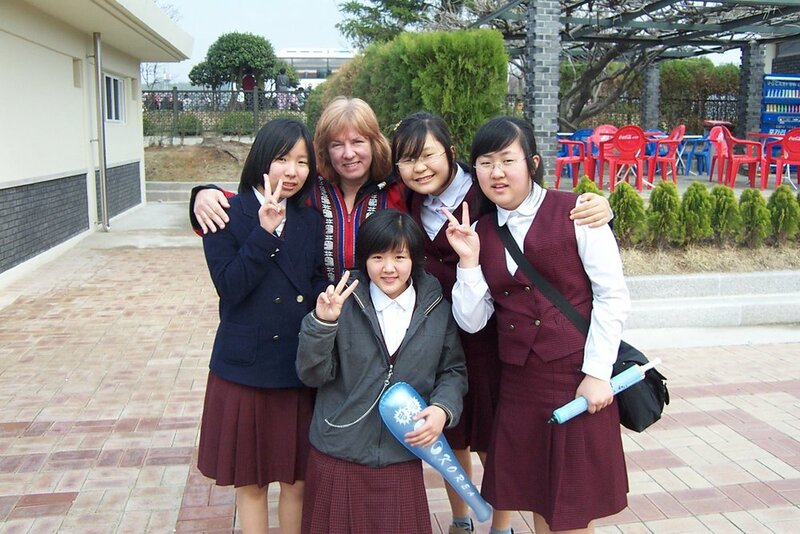 Pictures of Stephanie surrounded by gaggles of grinning schoolgirls. Pictures of us in restaurants, the table loaded with colorful but unidentifiable dishes. I wish I had written captions, so I could figure out later where we were and what we were doing. 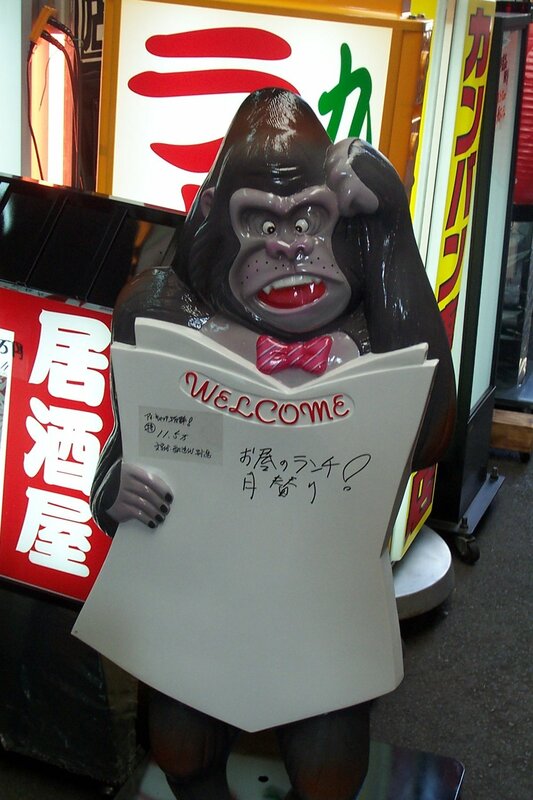 Then it was on to Osaka, where we shopped and went to a baseball game. We visited the temples and shrines of the ancient city of Nara and fed deer in the parks. We joined Tad Watanabe, one of Stephanie’s friends from the linguistics graduate program at Ohio University, on a day trip to Kyoto, the former capital in central Honshu, famous for its classical Buddhist temples, gardens, imperial palaces, Shinto shrines and traditional wooden houses. I must say—and do so with the utmost respect to colleagues and friends who love the country—that of all the countries on the voyage, Japan made the least impression on me. I’ll attribute that partly to the fact that we were nearing the end of the trip and looking forward to being home again. 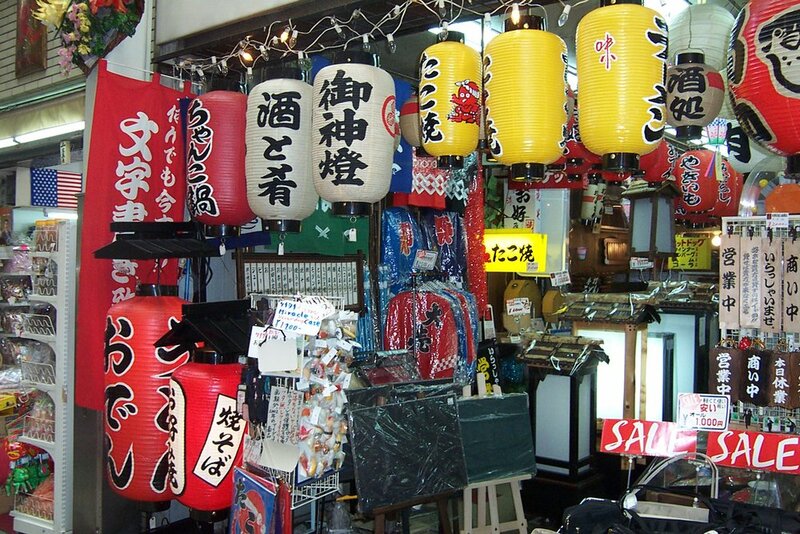 It also had something to do with the orderly nature of Japanese society. The streets are clean, the trains arrive on time, and everyone is polite, if rather reserved. It all seemed just too neat and predictable. This, of course, is my failing, not Japan’s. I was simply not in the country long enough to understand much about its history and culture; if I was there longer, I’m sure I would have liked it more and started to appreciate cultural nuances. I simply prefer other countries—Brazil, Cuba, India, South Africa—that are rougher around the edges and where things don’t work so well. My major travel adventure in Japan was to (innocently) jaywalk while other pedestrians waited obediently for the crossing light to change. It’s more dangerous, but also more exciting, crossing the street in India. The Bering Sea between Japan and Alaska lived up to its reputation for heavy seas. For five days, the Universe Explorer rode the waves and swells, while we staggered along the corridors and clung onto the handrails. On some days, the weather was so bad that no one was allowed out on deck, making the ship feel even more claustrophobic. Unfortunately, the crossing coincided with two days of final exams. Students would write a few lines on their exam papers, then lurch out of the classroom to the bathroom to throw up. I gave all my classes extra time to complete their exams. We docked in Seward on Alaska’s southwest coast for a day, then headed southeast to Victoria and, at last, on May 6, arrived in Seattle. Stephanie and I said farewell to the friends we had made on the voyage and flew home. Final week: Would I do it again? Over the next few days, morale and energy levels on the ship sagged. Until this point on the voyage, we could confidently look forward to the next port of call and show up for the global studies sessions eager for information about a new country. Now, although the Universe Explorer continued to sail in a northerly direction, we had no idea where we would end up. Each day, we checked the ship’s position as the list of SARS-free ports dwindled. One day, Manila looked like an option, the next it was in the rear-view mirror. We passed Taipei and headed into the East China Sea. If all ports in China were off limits, then it had to be Japan. 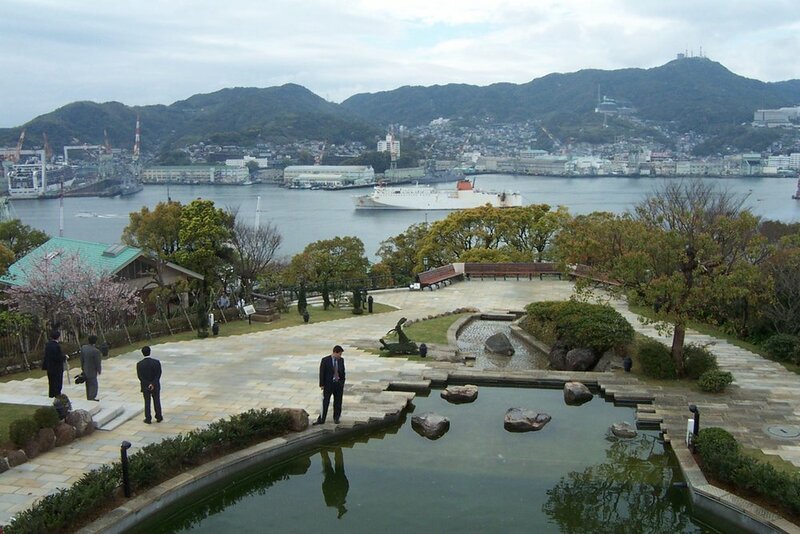 The slightly surreal nature of the voyage seemed complete when we docked in Nagasaki on Japan’s southernmost island, Kyushu, on April Fool’s Day. The 12-day voyage from Singapore had been our longest stretch at sea. The ship had restocked with food in Singapore, but by the time we passed north of Taipei the cafeteria had run out of fresh vegetables and fruit, and the food was looking and tasting warmed-over. There was some grumbling about making two visits to Japan (we later made a scheduled stop in Osaka) but most people were simply happy to get off the ship, stretch their legs and enjoy a restaurant meal. Because Nagasaki was not on the itinerary, no field trips had been planned. Fortunately, there was plenty to see in a historic port city where, even before its name became synonymous with nuclear warfare, the Portuguese, Spanish and Dutch had competed for trading privileges, and Catholic missionaries found converts. Religious repression followed, and Japan entered almost two centuries of relative isolation before the Meiji Restoration of the 19th century. 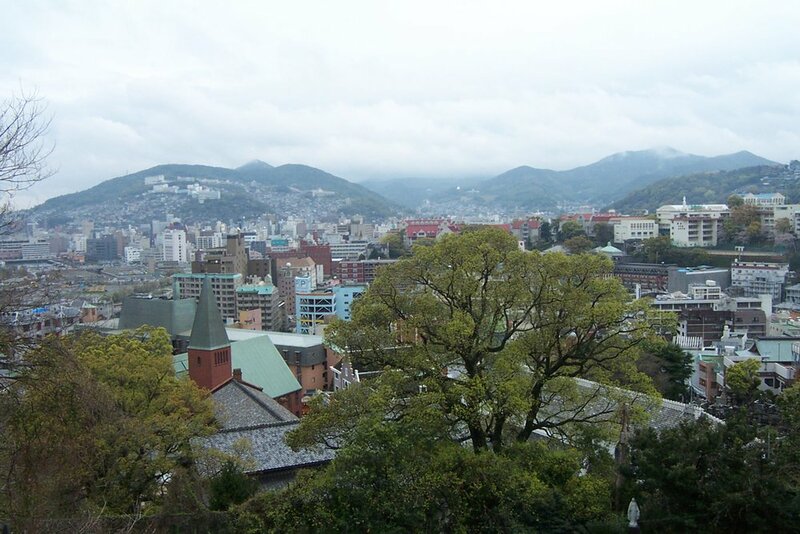 With the reopening of the country to foreign trade and diplomatic relations, Nagasaki became a free port in 1859 and regained its role as a center for Roman Catholicism in Japan. Its main industries were shipbuilding and munitions, making it a frequent target for Allied bombing raids in World War II. The nuclear strike on August 9, 1945, destroyed most of the city’s industries and killed more than 35,000 residents; many more were to die in the years that followed from radiation-related diseases. The “Fat Man” plutonium bomb dropped from a B-29 Superfortress was more powerful than the one dropped on Hiroshima three days earlier but because of Nagasaki’s hilly terrain, there was less damage. It was a moving experience to visit the Peace Park and the Atomic Bomb Museum. On the third day, Stephanie and I did what we often do in new cities—ride around on public transportation, without any particular destination, getting off when we see something interesting. In a downtown square, a crowd had gathered. On stage were speakers and a singer playing guitar and a harmonica. Stephanie said it reminded her of the Vietnam peace rallies she had attended in the 1970s. We got off the streetcar and joined the crowd. It turned out to be a rally to protest the invasion of Iraq, but people greeted us graciously, and there was no hint of anti-American sentiment. A message was passed to the main speaker that Americans from a ship were in the crowd, and I was invited to address the rally. I made a short, impromptu speech, with a survivor of the atomic bombing translating. I don’t recall exactly what I said, but I know I said how moved and humbled we had been to visit the city’s commemorative sites and learn about the true horrors of war. The rally, I was told, was held not only to protest the invasion of Iraq, but all wars. I told the crowd that, despite what they read or saw on TV, not all Americans supported the Iraq invasion. As I left the stage, I started to cry and hugged Stephanie. I knew that what I said would not change anything, but I felt I had to say it. The news came at a late afternoon meeting of students, faculty and staff. After a couple of days of e-mails and calls between Captain Andersson, the executive dean, Ed Gladfelter, the SAS office in Pittsburgh, the ship’s owners in San Francisco and the Centers for Disease Control, the decision was made to cancel our stops in Ho Chi Minh City, Vietnam, and Hong Kong because of the spread of the mystery disease SARS (Severe Acute Respiratory Syndrome). According to early reports, the disease was first identified in southern China in November 2002 but the Chinese (with their tradition of state secrecy) didn’t tell the rest of the world about it. It spread to Hong Kong and other areas of southern China, and then through travelers to Vietnam and other countries. Speculation over where we would next land was rife and provided a teaching moment. Students scanned maps for possible ports, gaining a new understanding of the geography of East Asia. Perhaps Taipei? Manila or another port in the Philippines? My money (or perhaps it was a repressed desire to use my language skills) was on Vladivostok. Meanwhile, the whole class schedule was thrown into confusion. One of the first questions from students was whether the next global studies exam would be postponed. As Ed said: “We’re at war in Iraq, there’s a mystery disease rampant in Asia, and you’re worried about an exam?” We felt sorry for our colleague Kent Guy, who was teaching the History of China course, and was due to lead several field trips. Indeed, we had several East Asia specialists on board who had a lot riding on China. My situation wasn’t as complex. I was scheduled to lead two trips in Vietnam, but neither was crucial to my courses. Still, I had to revise assignments and due dates, and not for the first time on the voyage. One of the ship’s two computer servers had been down since Salvador so students could not use the library’s online catalog or articles database. Research was reduced to scanning the stacks for relevant works (there were fewer books than in a small public library, so it did not take long), asking faculty if they had materials, or going online at 50 cents a minute. Descending again to the lowlands—a four-hour bus trip on twisting roads through tea plantations, which divide the hillsides into intricate geometric designs and shapes—we arrived at the town of Kottayam and boarded a boat for a three-hour trip along the backwaters of Kerala to Allepey on the west coast. Most of this area is below sea level and crisscrossed by waterways used to irrigate the rice paddies. Small houses on narrow levees fringed with coconut palms line the banks. Children were swimming and fishing, and women hanging out clothing to dry; in the middle of the waterway, men were digging sand and loading it into a boat. The rice harvest was under way. Men and women gathered rice stalks and carried them in huge sheaves to the river bank, where machines separated and husked the rice. 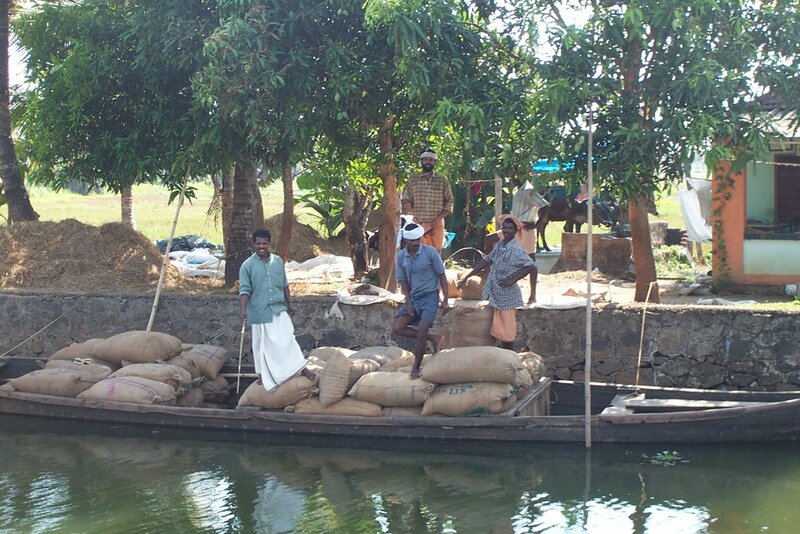 It was packed into sacks and loaded onto narrow boats for transportation to the nearest road junction; at one place, we saw men unloading a boat, using ropes and a pulley to move rice sacks to a truck. Nearer the coast, we started seeing large houseboats. 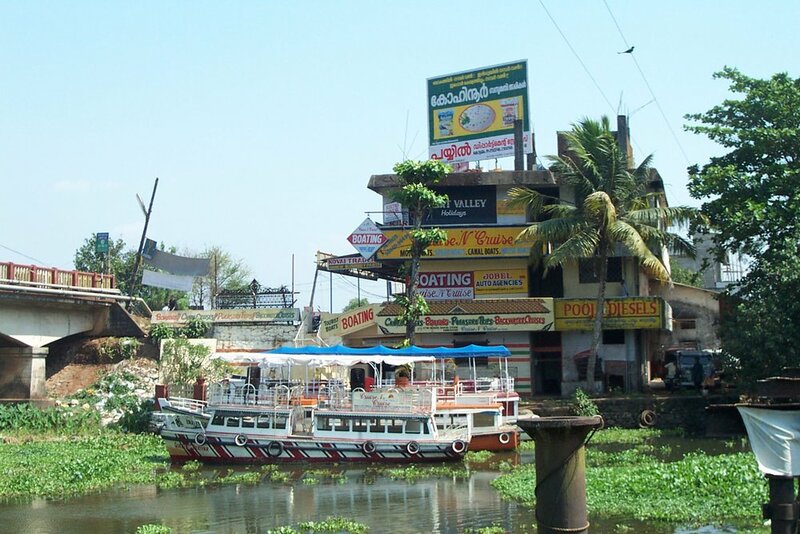 Borrowing the concept from Kashmir, this is the up-and-coming tourist industry of Kerala, attracting many Europeans; for $200 to $400 a day, you rent a houseboat with a bedroom, covered dining area and other conveniences, and a two-person crew to pilot and cook. Most were occupied by couples, lazing in the late afternoon sun sipping cocktails. On the bank of the waterway, a red flag fluttered high on a flagpole. In several years of travel in the former Soviet republics of Central Asia it was something I had never seen—the distinctive red flag of the Soviet Union with the hammer and sickle. Earlier in the day, I had seen a hammer and sickle painted on a wall. Later, as we traveled north by bus from Allepey to Cochin, the road was temporarily blocked by protestors, again waving red flags. Since India’s states were created in the late 1950s, largely along linguistic lines, Kerala has been alternately ruled by the Congress Party (the original party of Gandhi and Nehru) and the Communists. The state has the highest literacy rate in the country (over 90 per cent), and women have more rights than in other regions. Kerala also has more of a religious mix than other states, with about 30 per cent of the population Christian. However, unemployment is high, reportedly because businesses fear red tape, state interference and labor stoppages. Indeed, the next day, most of the shops in Cochin were closed because the Communist Party (currently out of power) had called a general strike to protest the police killing of a demonstrator in a protest by indigenous peoples. Cochin was founded by the Portuguese in the early 16th century, and the explorer Vasco da Gama died there in 1524. The Dutch captured Cochin in the late 17th century, only to be booted out by the British just over a century later. It is a fascinating cultural mix: the oldest European-built church in India, which switched from Catholic to Calvinist to Anglican as the colonial rulers changed; a 16th century palace built for the local maharajah by the Portuguese in return for trading privileges; and the Jewish quarter, settled by descendants of people who fled Palestine 2,000 years ago but now reduced (largely by migration to Israel) to a community of less than 20 with a street of shops and a 16th century synagogue. Back in Chennai after a 14-hour overnight train ride, we used the last day to go shopping for fabric and clothes. With a population of about nine million, Chennai was by far the largest city we had visited on the voyage. It was also the most crowded, the roads full of cars, auto-rickshaws, motorbikes with women passengers in saris riding side-saddle, bicycle rickshaws, bicycles and the occasional ox cart. Part of the fascination of a city like Chennai is simply the visual clutter, with shop signs, hoardings and large billboards with all sorts of pro-social (“Books are lighter than bricks. Put a child laborer through school”) and commercial (“World Cup video replays on your Hutch GPRS mobile phone”) messages. After the exhausting five-day safari in Tanzania, Stephanie and I decided we needed less travel in India, so settled on a three-day group trip from Chennai to the south. It was a small party of 19, with about half faculty or adult passengers. We boarded the night train at one of the city’s two railroad stations, Chennai-Egmore, built by the British in grand Victorian style. In most Indian cities, the station is the center of activity, crowded with passengers, freight and mail, the platforms lined with small restaurants (vegetarian and non-vegetarian), stalls selling soda and water (no alcohol allowed on Indian trains), cashews, and chips made from bananas and tapioca. The railroad system seems to reflect India’s complex society: there are waiting rooms for each travel class, porters with red cloth headbands carrying luggage on their heads, beggars and businessmen, and a labyrinthine bureaucracy for buying tickets and making reservations. With 1.7 million workers, Indian Railways is the largest single employer in the country. Our first-class sleepers were a bit cramped, but at least the air-conditioning worked, and some of us snatched a few hours’ sleep. At 6:00 a.m., the station at Madurai was busy as we dragged our overnight bags to the bus. Madurai is one of the seven sacred cities of India, and we spent the morning touring the huge Hindu temple of Sri Meenakshi with its 12 towers of brightly colored statues, hall of 1,000 pillars and central pool. Temples in India are—as much as mosques and perhaps more than churches—social centers, so the place was crowded with people, some of them worshipping, others begging, some just hanging out. It is also a commercial center with stalls selling tourist trinkets—beads, wooden elephants, key rings and the like—along with religious objects. 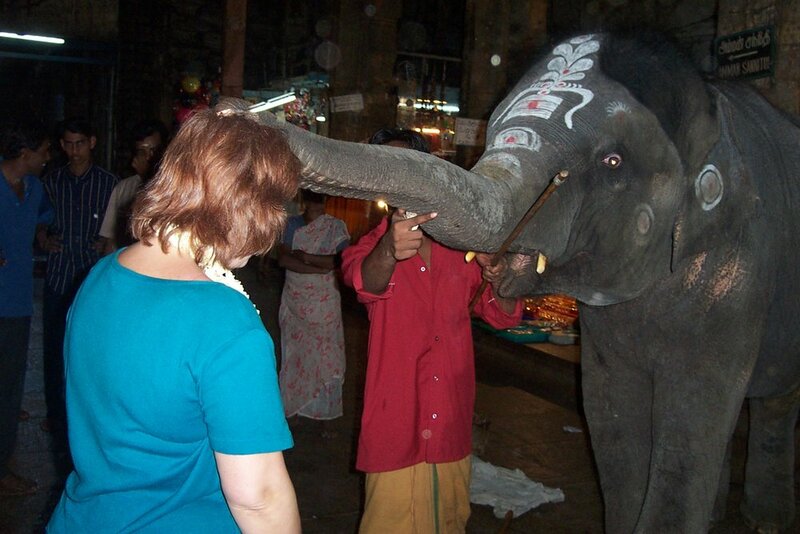 Almost every temple has a resident elephant, the physical embodiment of the god, Ganesh. The one at Sri Meenakshi will bless you and give you a nice wet back rub with its trunk for 20 rupees (about 40 cents). After lunch, we set off towards the Western Ghats, the mountain chain that straddles the states of Tamil Nadu in the southeast and Kerala in the southwest. The road ran through villages with coconut trees and rice paddies, giving us our first glimpses of rural south India. The road was narrow, but crowded with buses, cars, trucks, people walking and cycling, and carts pulled by oxen. Many oxen sported brightly colored horns (blue, green or a rather stylish red, black and white tricolor design). Apparently, they’d been dressed up for a recent harvest festival. Our guide told us that politicians, appealing to illiterate voters, sometimes pay farmers to paint the horns in the party colors—political communication in its most basic form. Climbing through the jungle on narrow, twisting roads, we reached the resort town of Thekkady. It is about 4,000 feet above sea level, cool and pleasant—a welcome change from the sweltering heat of the lowlands. Next morning, we took a two-hour boat ride on Lake Periyar, an artificial lake formed by a dam. Today, it’s a wildlife sanctuary, with a landscape rather like the Everglades; we passed dead trees still standing 20 years after being submerged. We saw gray herons, bright green kingfishers, snake birds, cormorants, egrets, otters, wild boar, bison and elephants; the most exciting scene was when a mother elephant and her baby swam across the lake about 50 yards in front of the boat. We did not see tigers, which still live in this area of the highlands. The guide told us that one had been seen in late January near a lodge in the preserve, but tigers are reclusive, and unlike the lions in Tanzania don’t usually show up for the tourists. It was an eight-day voyage with no breaks in teaching from Dar to Chennai (Madras) in southern India. Our route took us north of the Seychelles, then southeast to the Maldives, and around the south and east coasts of Sri Lanka. How can I describe my impressions on my first visit to India? It defies description in every way. Such contrasts—conspicuous wealth and grinding poverty, five-star hotels and people sleeping in the streets, ancient temples and modern high-rises, a place where you can eat for less than a dollar or more than $50, where community is important yet, even in the remotest villages, you can make an overseas phone call or get on the Internet. It’s a kaleidoscope of sights, sounds and feelings that excites but also challenges and disturbs some Westerners. The more I saw and learned, the more I realized how little I knew. The first logistical challenge in any port is to get more than 700 people—students, staff, faculty and crew—through immigration and customs. SAS wisely orders the immigration and customs forms in bulk and has everyone fill them out in advance, saving several hours at each port; even in Havana, the ship was cleared within a couple of hours. But no amount of planning can take account of the caprices of the Indian bureaucracy, one of the least appealing legacies of the British colonial period. Not only did everyone have to go through the line to present their passports for inspection and fill out landing cards, but then a customs officer set up shop in the gangway to review customs declarations and inspect bags. Although we were dockside by 8:00 a.m., the ship did not clear until almost 12:30 p.m., and some people did not get off until an hour later. I was among the first to leave the ship with a group of 30 students for a trip to Chennai’s leading TV and movie studio. AVM, which had been in business for over 30 years, produces TV serials (soaps) in the main South Indian languages (Tamil, Telugu, Kannada and Malayalam), commercials and feature films. The tour company evidently hadn’t done much planning, because when we arrived at the studio there was no one to welcome us. The tour agent eventually located the art director, who agreed to take us around but evidently did not relish his new role as tour guide. Instead of addressing the whole group, he insisted on speaking (mostly to me) in hushed tones. I then had to relay what he said to everyone else and ask lots of questions. We started at a modest sound stage—the interior of an upper middle-class home—where a Telugu-language soap was being shot. A standard set—three living rooms, a bedroom and a kitchen, and a grand staircase for those emotional “I love you, but I must leave you” or “I will never call you my daughter again” scenes. Most soaps run four or five times a week and are on the air for one to two years before they play out all the plot lines, and the characters die or leave. I asked the “guide” about the plot. He shrugged. “It’s about a large family, about love and conflict.” Next door, at a similar-looking sound stage, they were shooting a Tamil-language soap. Again, I asked about the plot. “It’s about a large family, about love and conflict.” There were two more sound stages, both representing upper middle-class homes, basically the same in layout and design. And, I expect, with the same plot lines. Southern India is steamy hot for eight or nine months of the year. The studios had no air conditioning, so when the crew switched on the lights and turned off the huge fans, the heat was almost unbearable. This may be one reason why they do only one take on many scenes. We saw the crew shoot a scene for the Tamil-language soap. It consisted of the female lead walking down the staircase to join her family and exchanging sharp words with her husband. The fans went off, the lights went on, the director called “action,” and the single camera on a track tilted down and dollied across to the living room. Lights off, fans on, take complete, tea served. The director told me that he shoots a half-hour serial in a day (including actor and technical rehearsals), takes four hours to edit and airs the program two days later. 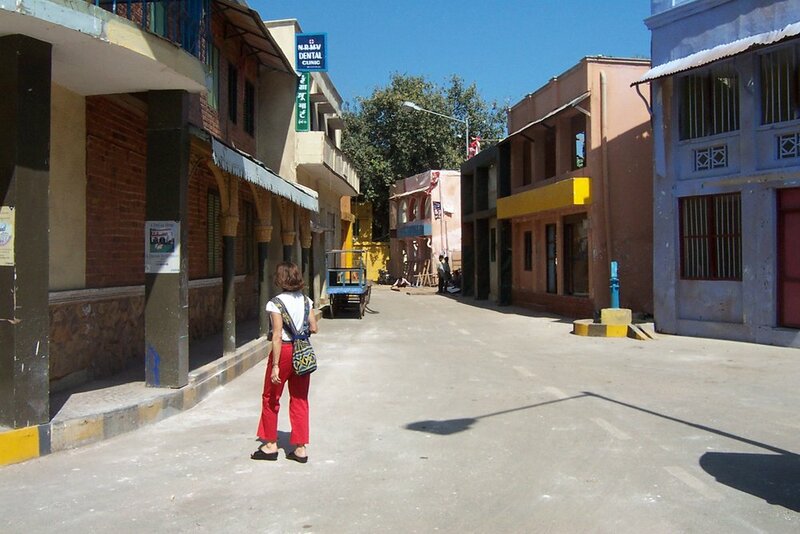 VM Studios' South Indian Street,"ready-made for scenes in any genre. Don't lean on those commercial facades--there's not much behind them! The soaps are not confined to interior sets. There are a couple of South Indian “streets” with storefronts, a market, a bank and a temple. When a family member turns to crime—perhaps toting one of the plastic Kalashnikovs we found on one set—the scenes are shot in the studio’s police station, jail and courtroom. Victims usually end up in the studio hospital. Eagle-eyed viewers may be able to spot that the courtroom in the Tamil soap looks remarkably like the one in the Telugu soap, but there’s not much language crossover so it’s not a problem. Not the students I wanted to see locked up. See "Safari blues." After Mumbai (Bombay), home of the Hindi-language Bollywood film industry, Chennai is in the next tier of movie production centers. These films are shown not only in India, but in other parts of the world where people have migrated for work—for Tamils, that’s mostly in Southeast Asia and the Middle East. At AVM, a palace set for a movie was under construction. Workers were sawing wood strips, nailing them together into frames, and laying sackcloth to be covered with plaster and painted; others were working on the 200-plus ornate columns (thin plywood and plaster) that would adorn the palace. It was going to be a large palace. “How long will it take you to build it?” I asked. “Two days” was the confident reply. Just as the TV soaps operate on a tight budget and production schedule, movies tend to be formulaic, no-frills, low-budget affairs. With a little creative lighting, you can always cover up that large hole in the wall of the palace. In India, movie-going is mass entertainment, and even poor people can sometimes afford a movie ticket. Profit margins are relatively low, so wages and production budgets are modest. If they can build a palace in two days, they’ll probably shoot the movie in two weeks. “Excuse me, sir—we have a problem.” The safari director, who had been hovering by the restaurant door, approached my table as discreetly as he could. I was enjoying lunch with Ruth Krulfeld of George Washington University, the other SAS faculty leader, and looking forward to our early afternoon departure to the Serengeti. “What’s the problem?” I asked, determined to continue my lunch. The director looked uncomfortable. “Perhaps we should discuss it in the hotel manager’s office?” I looked at Ruth and she nodded. We got up and left the room. The hotel manager was direct. “Room 103. When the housekeeping staff went in to clean this morning, they found a terrible mess, and a red substance splattered on the walls. Maybe it’s wine, maybe it’s blood. The staff are afraid to clean it.” Ruth and I understood the concern; in a country where HIV/AIDS rates had been rising, people feared contact with what might be contaminated blood. “This is a matter for the police. We may have to press charges for malicious damage,” the manager concluded. My mind was racing. On the road trip from Arusha, I had read an article in The Economist on the appalling conditions in Kenyan prisons. I didn’t imagine those in Tanzania were much better. Ruth and I didn’t want to return to Dar and report that we had left a couple of students rotting in jail. “Before you call the police perhaps we should talk to the students?” Ruth suggested. “I’ll find them,” I volunteered. At the restaurant, I identified the two male occupants of 103. One claimed the toilet had overflowed and that he had tried to clean it up. Their stories started unraveling when it turned out that a third student had thrown up in the room. Three students had gotten so drunk that they didn’t remember what they did. Ruth and I were shocked. What sort of message did this send to anyone—the hotel, the safari company, ordinary Tanzanians—about how Americans behave and their respect for others? After it was determined that the red stuff on the walls was wine, not blood, one student offered to pay $100 for cleaning. I thought this was on the low side but was told that a larger bill would make the police suspect the hotel staff of corruption. Ruth and I assured the manager the conduct was not typical of SAS students and apologized on behalf of the program; the manager agreed not to file a criminal complaint. Two days later, on the bus back to Dar, I shared the Economist story on Kenyan prisons with the students. They did not seem contrite, appearing to write off the incident as an expensive prank. I told them Ruth and I had compiled a report to the Executive Dean. They might face disciplinary charges, or even be sent home. They did not seem worried about the consequences. As it turned out, they were right, and we were wrong. You can’t keep things like this quiet, so word about the trashed room spread quickly among the group. Most students were disgusted, and angry that the departure for the Serengeti had been delayed by more than an hour. The mood improved as we saw more wildlife, including the first giraffes of the trip. Franky found a place where elephants were crossing the road. They almost seemed to pose for us, the babies trying to emulate the moves of the adults. We joined other vans to see lionesses and cubs prowling along a creek, occasionally pulling meat from a grey animal carcass. Franky guessed it was a Cape buffalo. Suddenly, a female elephant appeared. The lions scattered, crouching and waiting to see what she would do. Slowly, gently, her trunk reached down and lightly caressed the body, alighting and moving, touching, prodding. It was one of the saddest things we’d ever seen. We left the scene with heavy hearts, knowing the waiting lions and vultures and jackals would take their turns in this cycle of life and death. The safari director surmised that the baby elephant had succumbed to illness, because lions would be no match for a mother defending her baby. He told us stories of seeing mother elephants pushing dead babies for several days, trying to bring them back to life. Someone recommended a book called When Elephants Weep. The road to Arusha—a crossroads town on the route to Nairobi and the jumping-off point for most safaris—runs northwest from the coastal plain through sandy brush country to the mountain range that forms the northern border of Tanzania, leading to the Great Rift Valley and Mount Kilimanjaro (19,341 feet), the highest peak on the African continent and the highest free-standing mountain (not part of a range) in the world. It’s a heavily traveled route, used by trucks heading from Kenya and Uganda to the coast. For long distances, people travel in a minibus (shared taxi), a matutu. The word is derived from a Swahili colloquialism meaning three, but we were told that in practice it means “there’s always room for three more.” Although the road surface is well maintained, it’s a two-lane most of the way; despite frequent speed bumps, crashes are common, and on the return trip we saw several vehicles off the road. The danger of accidents is increased by the number of people on the road, most on foot, some on bicycles, carrying produce, firewood, building materials, farm tools. For women, the go-anywhere-hold-anything five-gallon plastic bucket (in blue, red, yellow or black) seems to have replaced the traditional basket or pitcher as the vessel of choice to carry on the head. Most rural people live on what they grow and raise—maize (corn), beans, sweet potatoes, bananas—with a few goats, cattle and chickens. Because of the tropical climate, farmers plant two crops a year; as we traveled northwest, fields were being burned in preparation for planting and the rains, due to start at the end of March and last until May. Most cash crops—tea, coffee, cashew nuts and sisal (which looks like a giant yucca plant or an upside-down pineapple)—are grown at higher altitudes on commercial farms and have a single growing season. We arrived in Arusha after nine hot hours on the road. At the hotel, some of the 70 students were welcomed by their parents, who had flown into Nairobi three days earlier to join us for the safari. We left the next morning—a total of 102 people, in 13 eight-passenger Toyota safari vans, each with a driver. Our driver was Franky. An hour out of Arusha, we turned off the main road. It was the last blacktop we would see for three days. Safari guides delight in telling you that there are three types of roads in Tanzania—the good, the bad and the ugly. For those three days, our travel was on the bad-ugly continuum. There’s a positive side to the problem: rutted, rocky roads (impassable during the rainy season) deter tourists from driving cars into wildlife preserves. Who wants a flat tire or an overheated radiator when you’ve stopped to photograph the lions? The parks restrict vehicles to those with safari guides, so most are four-wheel drives. Still, the going was tough. Franky reckoned that most vans did not last more than four years on the safari circuit. Some end up in Dar, where they have a few extra years of useful life as matutus. By early evening, we reached our first safari destination. 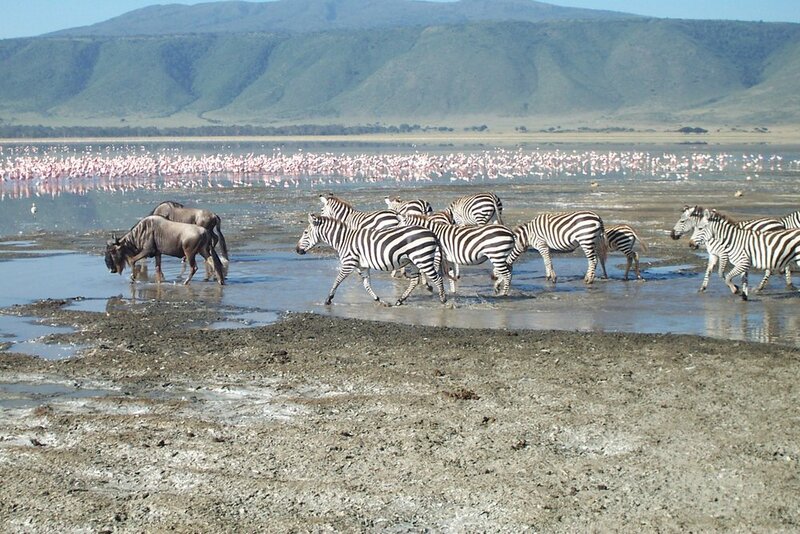 The 100 square mile Ngorongoro Crater, created by volcanic and rock movements in the Rift Valley, is one of the great natural wonders of the world. Because it’s relatively isolated, it’s a haven for wildlife. From the observation deck of the Ngorongoro Wildlife Lodge before dinner, we scanned the crater floor, 2,000 feet below, with binoculars. Herds of wildebeest and Cape buffalo were on the move. We saw two elephants and a white rhino. It was exciting to think that next morning we would be in the crater itself. After a mildly exotic dinner, featuring barbecued gazelle kebabs (on the chewy side) and roast warthog with barbecue sauce, we turned in early. You can’t lounge around in bed when animals are waiting to be seen. The wake-up call was at 5:30 a.m. In the early-morning light, we descended a winding, rocky road to the floor of the crater. Everywhere we looked, there were animals—herds of zebras, wildebeest, Cape buffalo, Thompson’s gazelles, flocks of flamingoes. We watched a group of hippos, keeping cool in a pool. As they shifted to find more comfortable positions, often resting their heads on others, our cameras clicked away at huge yawns and what looked like contented grins. Then Franky got a call from another safari driver—a rare black rhinoceros had been sighted. We sped off to the location. Poaching has vastly reduced the population of black rhinos in the crater. Their horns fetch a high price on Asian markets where they’re ground into powder, mixed with other substances, and sold to males who believe the potion will increase their virility. Stephanie and I decided that South Africa was the only country on the voyage where we could safely rent a car and take off for a couple of days. Finding a car was a problem. We had arrived in South Africa in the middle of the Cricket World Cup series and the upscale waterfront area where the ship docked was full of British and Australian cricket fans. The guy at the Cape Town Tourist Office was not optimistic. “I don’t think there are any hotel rooms or cars left in Cape Town,” he said, making us feel relieved we had a cabin on the ship, but after a few calls he found us a small Toyota. We set off for the highway that would take us south to the peninsula, and eventually the Cape of Good Hope. We stopped for lunch at Kalk Bay, one of many small towns that look like English seaside resorts. South of Simonstown, we visited a colony of tame penguins. The southernmost part of the peninsula is a national park, with sweeping vistas, towering cliffs, rocks and sand. On the one side, the Atlantic rollers crashed on the shore; on the other, the calmer waters of the Indian Ocean. Out at sea, we saw two whales leaping and spouting. In the warm light of early evening, eland antelope came out to graze. With night falling, we drove up the narrow road on the western (Atlantic) coast to a small town, Kommetjie. We stopped at the general store to ask if there were any hotels or guesthouses. The store owner wrote down two numbers and Stephanie called the first; after a few seconds, she started speaking in German. It turned out that the guesthouse owner was from Cologne and had retired there. Frau Fendt started speaking in German and didn’t seem to notice that Stephanie responded without batting an eye. Apparently, the Fendt guesthouse expects advance bookings, and doesn’t get many walk-ins. After a solid German breakfast of cold cuts and cheese, we drove up the coast back to Cape Town, ending up at Signal Hill—a stunning setting with Table Mountain, part of the southern mountain range, towering in the background, and sweeping views of the city. We took a one-day tour to the countryside northwest of Salvador, ending up in the old colonial town of Cachoeira (waterfall in Portuguese), founded in 1650 on the Paraguaçu River. This is one of the most productive agricultural regions in Brazil, where the Portuguese established sugarcane and tobacco plantations, shipping their produce down the rivers that flow into the Baia de Todos os Santos where it was loaded onto ocean-going ships. Today, agriculture is more mixed, with maize, rice and a wide variety of fruits (mangoes, papayas, oranges, bananas, jackfruit, cashew fruit) grown. Bamboo, originally imported from Southeast Asia, became not only a cash crop, but a local weed, growing wild along roadsides and in fields. Along the road we stopped at a cooperative farm—an example of what agrarian reform can achieve. The land was repossessed by a bank when the landowner defaulted on his mortgage payment; then the bank itself went bankrupt, and the government seized the land to pay back taxes. It distributed it to about 150 landless families, each of which has five hectares, a house and a garden; they contribute labor and part of their income to the community to support a school and other services and sell the rest of their produce. Cachoeira is a sleepy country town with gorgeous colonial architecture that recalls its history as a major river port and commercial center. With funds from UNESCO and foreign donors, some buildings have been restored. After lunch at a pousada, a country inn in an 18th century house, we visited the cigar factory where Stephanie learned how to hand-roll a cigar. Our other out-of-town trip was by schooner—a replica of the ships that traded between ports on the bay in colonial times—to the small Ilha dos Frades (the Island of the Friars), and the larger Itaparica Island, where middle-class Salvadoreans have weekend homes. The beach at Frades was idyllic, with white sand, and clear, warm water. After lunch on Itaparica and a quick tour of the town, we enjoyed the 90-minute trip back across the bay with good views of the old city. Salvador, founded as a fortress in 1549, was one of the first Portuguese settlements in Brazil. It offered a natural harbor—a large, deep bay, protected from Atlantic storms, which the Portuguese named the Baia de Todos os Santos (the Bay of All Saints)—and an easily defensible position, high on a bluff. It was the colony’s first capital, a center for slave traders and sugarcane exports. The old city, with its cobbled streets, dates from the 17th century, and its squares, colonial houses and Baroque and Rococo churches are remarkably well preserved. The new city, where the ship docked, is on a narrow strip of land by the bay; it’s a steep climb to the old city, so most people take the elevador (a public elevator) or the older funicular. 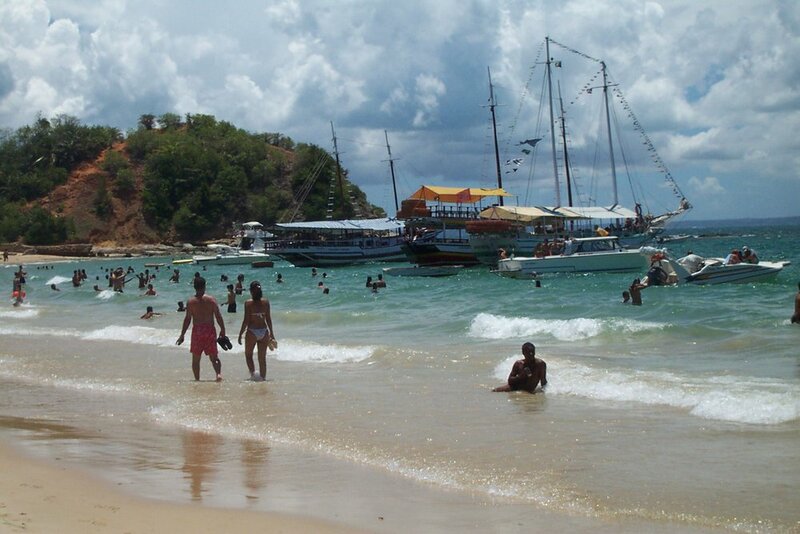 Salvador attracts tourists from other parts of Brazil and Latin American countries because of its history, beaches and rich Afro-Brazilian culture. The streets of the old city are lively and colorful; oil painters and wood artists display their work outside small shops, drum troupes and dancers perform in the squares. The most spectacular performance is a mix of dance and martial art, the capoeira. Slaves secretly developed capoeira, and it became a cultural symbol of resistance to oppression. Two combatants sinuously weave through a routine of acrobatic kicks, arm movements, cartwheels, headstands and back flips. A split-second error in timing, and you’ll floor your opponent with a body punch or kick; the art is to miss by a whisker. Capoeira is performed to the percussive beat of congas, pandeiros—a tunable hand-frame drum with metal jingles on the rim, like a large tambourine—and berimbaus—a single-string musical bow, of African origin. Capoeira is as much a part of the culture of Salvador as samba in Rio. We saw it performed by two professional troupes, by students from capoeira schools, and even seven-year-olds in the favela school. The only sport to rival it in popularity is, of course, futebol. I came a little closer to my goal of seeing professional games in as many countries as possible when the two local Serie A clubs, Bahia and Sporting Club Vitoria, met in one of the first games of the new season. It was a small crowd—probably no more than 10,000 in a stadium that can hold almost 50,000. The derby has a history of fan violence, and we were told that was why people stayed away. A tight first half, fought mostly in midfield, ended with Bahia grabbing two opportunistic goals. Vitoria put in a fine attacking performance in the second half and scored one, but despite lots of near-misses could not manage an equalizer. It was high-quality football—precision passing, good wing play, and intelligent defense. The other entertainment came from the rival fans, who beat drums, set off firecrackers and hurled Portuguese expletives at each other. The police, in camouflage outfits with sticks and dogs, looked more menacing than the fans. 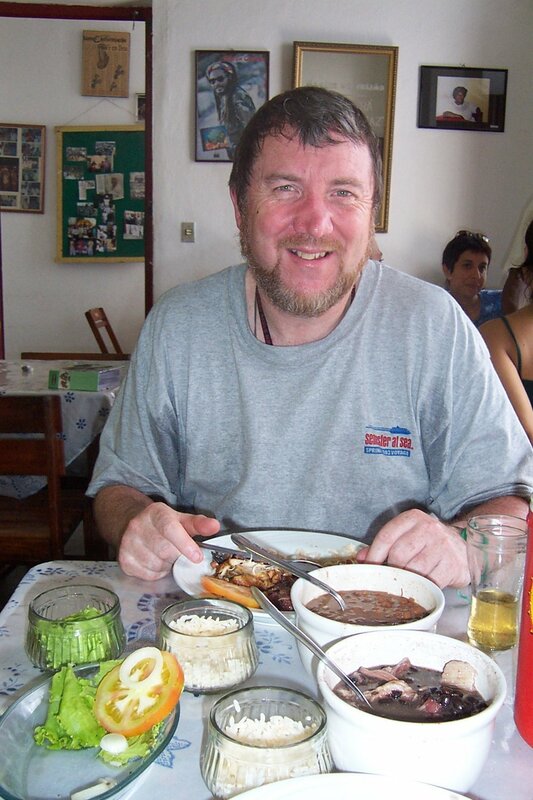 Eating out in Salvador’s old city was always an adventure. We avoided the tourist places and chose restaurants where Brazilians were eating (even if we couldn’t read the menu). Many dishes are based on the staples of beans and rice, with interesting flavors. We enjoyed feijoara, a spicy beef stew, other dishes with ham and chicken, and good seafood. The freshly made street drinks—iced, crushed sugar cane, and coconut water sipped through a straw from the fruit—were refreshing. We needed to keep refreshed, because the heat was intense. Not as hot as in Rio where students reported that the temperature reached 112 degrees Fahrenheit one morning. And not as humid as the Amazon, where students said they went through three or four shirts a day. But hot enough for us. Salvador, about halfway down Brazil’s 4,600-mile Atlantic coastline, is the country’s fourth largest city. It has grown rapidly from a population of about one million in the 1970s to about three million today, close to that of the capital, Brasilia. Although some growth was natural, most was fueled by rural migration. Brazil’s greatest social and economic problem is the uneven distribution of land and wealth. Economic growth and government programs have lifted almost 30 million people out of poverty since the turn of the century, reducing the poverty rate to less than 10 percent (about 16 million people). Yet the rich continue to benefit the most: between 2001 and 2015, the richest 10 percent accounted for 61 percent of economic growth. Brazil’s six richest men have the same wealth as the poorest 50 percent of the population, around 100 million people. To illustrate the wealth gap, OXFAM projected that if those same six men pooled their wealth (which they would never do) and spent one million Brazilian reals (around $319,000) a day, it would take them 36 years to spend all their money. The roots of the wealth gap lie in Brazil’s history as a Portuguese colony, a source of raw materials, minerals and cheap food. Landowners imported slaves to work the sugar cane and tobacco plantations; the center of power and wealth was the casa grande, the manor house where the landowner lived with his family, servants, concubines (and a resident priest, to insure divine approval). Brazil was the last country in the Western world to abolish slavery in 1888; by that time, an estimated four million slaves had been imported from Africa, 40 per cent of the total number of slaves brought to the Americas. Most land is still owned by a small group of mostly absentee owners, who employ laborers or rent it to small farmers. Under Brazilian law, a person who has occupied land for 10 years has the right to stay on it, so landlords routinely evict tenant farmers before they can claim the right. Since the mid-1990s, a grassroots political movement calling for agrarian reform and redistribution of land has gained strength. In October 2002, Brazilians elected a former trade union leader, Luiz Inácio Lula da Silva (popularly known as Lula), as the country’s first leftist president. Lula promised to narrow the wealth gap, improve social services, and begin land reform. However, he faced a daunting task, given Brazil’s huge foreign debt, economic problems and pledges to the International Monetary Fund to restrain government spending. The US White House branded Lula as a Marxist during the election campaign, warning of a Latin American “axis of evil” of Cuba’s Castro, Venezuela’s Chavez and Lula. With his election, the Bush people had to moderate their tone, but there’s no doubt that their public comments led to doubts in the international community and a dramatic drop in the value of the real. Lula faced opposition from a conservative legislature and the moneyed interests in Rio and Sao Paulo. Under election law, all those of voting age are required to vote; those who do not can be fined, so election turnout is usually close to 100 per cent. Because of poor education and low literacy levels in some areas, political appeals are often simple—wall paintings with the name of the candidate, the party color and a number. Lula was elected with widespread support from Brazil’s working poor. Many were first or second-generation rural migrants who had moved to cities such as Salvador to find work, building rough houses on public or unoccupied land. These are the favelas, the shanty towns that dot the hillsides of Brazilian and other Latin American cities. The favelas have grown up higgledy-piggledy, with densely-packed dwellings, unpaved streets and open sewers. Houses cling precariously to the hillsides; a heavy rain can wash away the shallow foundations, burying homes and their occupants under mudslides. I joined the SAS group that visited Calabar, one of the oldest favelas in Salvador. People started building there in the 1950s, and they’re still building. On almost every street, someone was adding a second story to a home or making another improvement. Despite the poverty, people were proud of their homes and community, and wanted to make it a better place to live. The favela has several small stores, a community center, a school (partly funded by Brazilian and international donors), and an active community association that lobbies city government for better services. Today, Calabar is surrounded by a high-rent district of upper middle-class apartment buildings; it’s close to the university and popular beaches, up the hill from the exclusive Spanish Sports Club and the Holiday Inn. Apartment dwellers and business owners complain that the favela lowers property prices, but residents have long resisted plans to move them to newer favelas on the outskirts of the city. Many make their living as street and beach vendors. It would cost them time and money to commute into the city. As with most property questions, it’s about location, location, location. The Calabar favela is in the right place. Calabar offers an interesting example of community communication. The favela “radio station,” a small room with a mixer and CD player, is staffed by volunteers who “broadcast” through loudspeakers on the streets (and in some homes)—an eclectic mix of music, news and community announcements. It serves as a community bulletin board. “Rafael Carvalho is working on his house today. He needs to hire two people to mix cement and lay bricks.” “The Santos family is worried about their daughter. She didn’t come home from school today—call the station if you see her.” At all times of the day, people drop in to deliver messages, and often go on the air. With minimal resources, the station helps the 3,000 or so favela dwellers stay in touch with each other and with the world outside. An hour before we arrived, the DJ announced that a party of US students would be visiting, bringing a box of supplies for the school. “They come as friends--please don’t steal from them,” he urged. We had a hassle-free visit. In a city where street crime is common—at least two students were mugged near the ship dock—the favela, one of the poorest sections of Salvador, was the safest, thanks to community communication. My three courses were all at the maximum enrolment of 35 students. This had less to do with the punchy copy I wrote for the catalog than with the fact that almost 100 students--about one in six—were communication majors. Dean Koehler had told me SAS normally hired two faculty members in communication but decided to go with one for this voyage. That may have been a miscalculation. One drawback of traveling east around the world is that the working day keeps starting earlier, at least until you hit the International Date line in the Pacific when, like Bill Murray in Groundhog Day, it was going to be April 29th, then April 29th all over again (both were scheduled class days, so there was no rest for the faculty). Along the way, there were 21 time changes. As a late addition to the faculty, I had no choice on schedule, and two of my three classes began at 8:00 a.m. That meant constantly setting the clock forward and getting one hour less sleep. The first time change came on the third day of classes. There was no system for announcing changes well in advance, because the ship might change course to avoid bad weather and not pass into a new time zone. You had to rely on the daily shipboard newsletter called the Dean’s Memo, which came out late in the day. The night before the first time change I asked the administrative office to make an announcement over the PA system. A straw poll of students the next morning indicated that at least one third of the class would have missed if it hadn’t been for the announcement. I resigned myself to a routine of time changes and lost sleep. Later, in the Indian Ocean, the ship made a speedy passage across two time zones in a 24-hour period. The captain was happy to be running ahead of schedule. His sentiments were not shared by those of us whose working day started at 6:00 a.m.
After a week or so at sea, your sense of time and space seems to drift away. Perhaps it’s the rolling of the ship, and the endless horizon. After we left Havana on January 25, we followed the northern coast of Cuba, then passed north of Haiti before cutting south through the passage between the Dominican Republic and Puerto Rico. We took a southeasterly course, staying on the western, more sheltered side of the Leeward and Windward islands before heading out into the choppier seas of the Atlantic beyond Barbados. Then we again turned southeast, passing Guyana, Suriname, French Guiana and the Amazon estuary in northeast Brazil. The announcements over the ship’s PA system were delivered by the Assistant Executive Dean, often tongue-in-cheek in the style of Radar O’Reilly’s in M*A*S*H. “A10 at 21:00 hours in the Union, the Tacky Tourist Dance. Be there or be square.” Of course, there was serious business too. With 700-plus people on a ship, safety is important, so there were special announcements for emergencies—from the standard Code Blue (medical) to MOB (man overboard). A couple of years earlier, a student attempting to re-enact the Leonardo DiCaprio/Kate Winslett bow scene from the 1997 movie Titanic took a dive into the Red Sea at night in the fog. Another student saw him fall and threw life preservers over the side to mark the area. A cruise ship does not turn on a dime, so it was 40 minutes before the Universe Explorer made it back to the area marked by the preservers. Miraculously, the student was rescued. The captain, an imposing Swede with the unforgettable name of Anders Andersson, delivered serious safety lectures. After leaving each port, we had a lifeboat drill, required under international maritime law. The rules were strict: you had to wear a life jacket, long pants and a shirt, a hat and close-toed shoes (because of the risk of sunburn in an open boat). Andersson marched up and down the deck inspecting faculty and students, quietly pointing out irregularities in dress code. At six feet five, in his white captain’s uniform, he cut an imposing figure. Stephanie and I were in the first group of faculty and staff invited to dinner with Captain Andersson. It was an elegant affair, with white table cloths, wine, waiters, and excellent food. We were seated next to the Polish chief engineer, who had interesting tales of growing up in the communist era and working in the shipyards of Gdansk—the birthplace of the Solidarity movement under Lech Walesa. It was an international group of officers, including a Canadian, Venezuelan, Taiwanese and Ukrainian. Most of the crew were Filipino, with a few from the Caribbean; our cabin steward, Glenford, was from Jamaica. More than 100 people (including three faculty, and some of my students) went for an additional ritual that did not wash away: they had their heads completely shaved. I was just getting to know the names of some of my students. Now I had a bunch of almost indistinguishable cone-heads. For Americans, the most familiar and surprising sights in Havana—apart from the former parliament, the elegant Capitolio, an almost exact replica of the US Capitol—are the old American cars. Fords, Plymouths, Studebakers and many more, most from the 1940s and 1950s, are still going, if not always going strong. During the Batista era, when there was heavy US investment, most cars were imported. After the revolution, trade ceased, so for decades Cubans have tried to keep their aging cars—tailfins and all—on the road. Cuban mechanics must be among the most inventive in the world, constantly retooling old parts or fashioning new ones in small machine shops. From the 1960s, Soviet-made cars including Ladas, Moskvichs and Nivas, started arriving, and many are still on the road; so too are Russian-built motorcycles with sidecars. Now Cuba is importing European and Japanese cars. But it’s the aging American giants that still add an air of faded elegance to the city’s roads. Next week: Is today a B-Day?